My dear grandma would be turning in her grave knowing we use cake mixes here at the inn. Yes, we can and do make many of our cakes from scratch. But when you’re adding flavorful ingredients, today’s cake mixes are both high quality and pretty foolproof to use as the basis for your baking. And they are great time-savers. Orange is one of my favorite flavors and this cake is just so cheerful to look at. How could you not love it? There are two choices for frosting this cake. 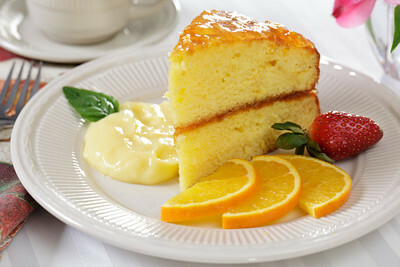 You can simply coat with Orange Marmalade and serve with whipped cream on the side OR you can make the orange frosting. Either way it’s delicious. This cake is very moist and will keep in the refrigerator for several days. It actually tastes even better the day after it’s made when the orange flavors have had time to fully penetrate the cake. Heat oven to 350 degrees. Grease two 8 or 9 inch round cake pans. Put the cake mix, pudding mix, 1 1/4 cups orange juice, 2 tablespoons of frozen OJ concentrate, 3 eggs and 1/2 cup of oil into a large mixing bowl. Beat well on medium speed of an electric mixer for about 2 minutes. Split batter evenly between the two pans. Bake at 350 degrees for 25 to 30 minutes, or until top of cakes are golden and cakes test done. Let cool for 15 minutes and remove from pan. Heat 1/4 cup of orange juice in a small saucepan and stir in sugar until dissolved. Brush this mixture over the cakes and let cool. To assemble cake, place bottom layer on serving plate. Warm up 3/4 cup of marmalade in microwave for about 30 seconds to make easier to spread. Spread evenly over cake. Place top layer over marmalade. If using marmalade for top, warm 1 cup of marmalade in microwave and spread evenly over top of cake. Garnish with rosettes of whipped cream before serving. If you prefer the orange frosting, combine the butter, OJ concentrate, powdered sugar and orange zest. You may have to add either powdered sugar or orange juice to get the correct consistency for frosting. Spread over the top of the cake. If you also wish to frost the sides, increase frosting recipe by half as much again.